While the default character avatar in Minecraft is a human being, there is a portion of its player base that would prefer to move, mine, and craft as something...otherworldly. 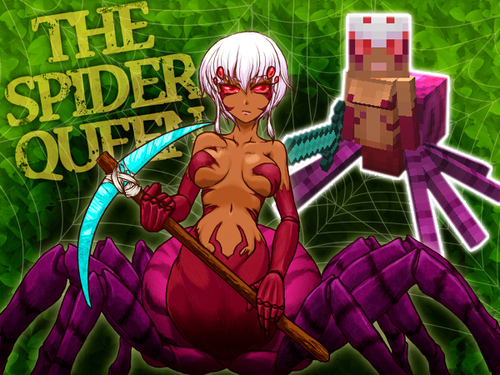 The Spider Queen Mod seeks to appease this particular subset by allowing you to play as a spider-human hybrid that can create webs, snare enemies, and hatch minions.The Spider Queen Mod for Minecraft not only changes the player character's avatar, it also alters the innate abilities of that avatar, climb walls and swing around the world via webbing, work with a reputation system between different creature types, and to see in the dark.Your character's new anatomy means that it will automatically generate string. Boom Spiders. These hatch from eggs originating from creepers and gain the explosive radius power of those annoying creatures. Inferno Spiders. These hatch from eggs originating from blazes and can create flaming webs. Rider Spiders. These hatch from eggs originating from horses and will serve you as a mount that can climb webbing automatically. Slinger Spiders. These hatch from eggs originating from skeletons and will web up your enemies.